The Purple heron (Ardea purpurea Linnaeus, 1766) belongs to the order of the Pelecaniformes and to the family of the Ardeidae and is one of the few herons of the palearctic, long range migrator. The Italian name of “ranocchiaia” (frogs eater) now abandoned and largely unknown to many, was instead commonly used in the XIX century and shown in all naturalistic books of the time and referred to the frog as that was thought to be the main food of this bird. It was already called also purple heron, direct translation from the scientific binomen even if the livery of this heron finally is not so much red. The etymology of the genus Ardea gets its origin from the Roman mythology and indicated the present city of Ardea in Lazio, at that time capital of the Rutuli, razed to the ground and totally burnt during the war against Aeneas. From its ashes got up a bird that after having emitted a long moan and having shaken the soot that covered it completely, turned out to be candid. Perhaps a direct reference to the legend of the Phoenix. The species purpurea comes from the Latin “purpureus” and this from the Greek “porphureos” meaning of purple colour. Generally the herons, but particularly those of the genus Ardea, have as peculiarity the elegance, the shape and the movements, when on the soil as well as when flying. Well, it is not unreasonable to maintain that the purple heron has all these characteristics, but even more marked. It is not as massive as the Goliath heron (Ardea goliath) but amply copies its livery. It is not as small as the little egret (Egretta garzetta) but is as thin and delicate as it. It is much more smaller than the great white heron (Ardea alba) but has the same powerful and regal way of flying. It is not so austere and patient like the grey heron (Ardea cinerea) but has the same tranquility and solemnity in the movements. There is no doubt that that every species may resemble its similars in some particular, but the purple heron definitely excels in the matchings. The vulgar Italian names often take, besides the colour of its livery, like in the dialectal names of Russiello, Sgarzon ross, Sgulgion russ and Sgherza rossa, also the term Sgarza, Sgarso, Sgors, taking a name with an old and complex etymology. The term garza often used for indicating the egret (Egretta garzetta), seems to come from the old Spanish garceta that in turn derives probably from the arabic ḡarzah, that indicated a pointed and blunt object. However, in some areas of the Iberian Peninsula, the term garceta indicates a ringlet of long hairs covering the nape, considering the tuft hanging from the head of almost all membres of this family. It is commonly called Purple Heron in English, Purpurreiher in German, Garza Imperial in Spanish, Héron pourpré in French, Garça-roxa in Portuguese, Airone rosso or Ranocchiaia in Italian and a nice Murasakisagi in Japanese. The territory of the purple heron is extremely vast and covers the central-southern area of Europe, of Asia and part of sub-Saharan Africa. In Europe, the nesting territory is very fragmented and not all its range is widely inhabited. Vast populations are present in the Iberian Peninsula, in France, in the Netherlands, in Germany, in Austria, in North Italy and much more assiduously in the Balkan peninsula and following the course of the Danube up to the Black Sea and venturing up to the central Asian republics. It is not present, if not in exceptional cases, in the British islands, in Scandinavia, Russia and Eastern Europe. In South Europe it occasionally occupies the Mediterranean area with some isolated colonies along the north-western African coasts, in Middle East and in Anatolia. In China it occupies all the south-eastern part, going north up to Manchuria and reaching also the Japan. In Africa it is well present in the sub-Saharan belt from Senegal to Ethiopia and southward, roughly following the Rift Valley, up to Mozambique and occupying densely the Zimbabwe and the Botswana. Conversely, it is absolutely absent in the western part of this continent. It Italy it is well diffused in the northern plains and in some ones of central Italy but is not to be considered as very common. The European populations and those of western Asia migrate by late summer towards Africa, with a long range flight that from the nesting territory gets up to beyond the Sahara. Those of eastern Asia reach, conversely, the south-east of the continent up to Indonesia whilst the Indian ones, the Indochinese and the African are basically sedentary. The purple heron is strictly linked to the humid environment with slow flowing and swampy fresh waters, densely covered by vegetation. It is an extremely reserved bird that avoids in an absolute way the places frequented regularly by the man, also in his agricultural activities, chosing very isolated sites inaccessible by land. It is also very reserved and solitary as does not even love the company of its similars. The dense expanses of phragmites, the islets in the middle of lakes or swamps with wrapping and untransparent vergetation, with few trees or low shrubs, with rotting bottom but always covered by the water, are its choice environment. Being a mainly nocturnal bird, it spends the day hidden inside the reedbeds, mid-thigh in the shallow water, usually with the neck straight and tapered or in any case always well camouflaged and hardly visible. Sometimes, when it feels menaced straightens the neck like the Great bittern (Botaurus stellaris) imitating perfectly with the streakings of the neck, the colour and the shape of the water reeds among which it is staying. And like this last, it has a very particular vision that allows it to look frontally also if holding the neck straight vertically or even when staying on its feet hunting. The eyes are very pronounced and exposed from the orbit that is markedly displaced towards the lower mandible, so much to render easier the observation of what is passes floating just under, besides observing in the same time all around. As its name says, the purple heron has a livery that shows, in part of the plumage, a more or less marked red amber colouration depending on the age and the season. A fairly similar livery to that of the Goliath heron (Ardea goliath) with whom it shares the African quarters in summer as well as during the winter influx of the migrating populations. 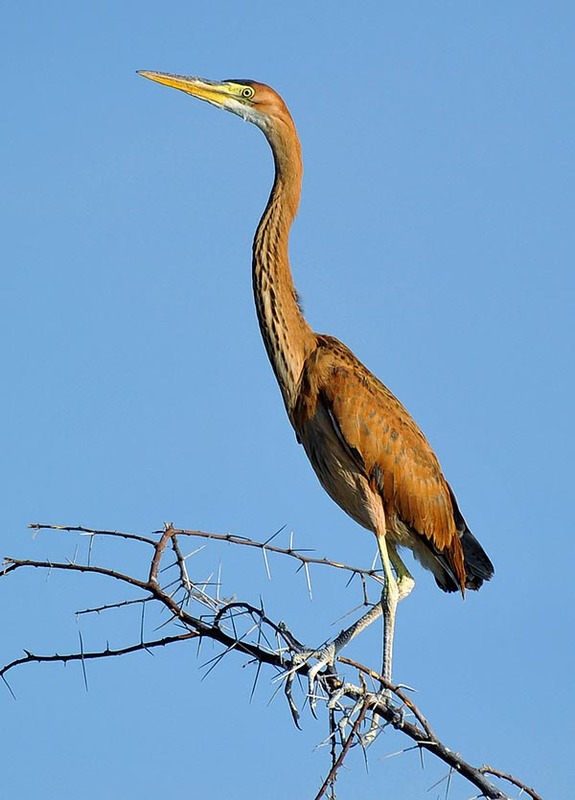 Of course, it does not have the same dimensions as the Goliath heron that are exceptional, but also the purple heron has a discreet structure measuring more than 90 cm of length, a maximum wingspan of 140 cm but with a weight that may reach only 1,3 kg exhibiting that slimness we mentioned before. The alar cover is ash grey tending to bluish and covers totally the shoulders up to the tail. On the front, head and cheeks are present black stripes that elongate on the neck forming narrow and long lines going down up to the chest, spaced in the length, with others of hazel and white colour. From the nape goes down on the neck a tuft of filiform feathers that form a soft crest about fifteen centimetres long whilst always on the head it has small erectile feathers that in the moments of agitation it can raise like a crest. The chest is of amber brick colour with blackish and whitish streaks but that becomes more hazel in the underwing and on the shoulders in correspondence to the junction of the remiges. Yellowish legs, long and bare with very long fingers and highly nailed. Also the bill is yellowish with blackish shades on the upper mandible. Eyes with yellowish iris, with very pronounced colour in the adults and particularly suitable for the night vision. The youngs are diffusely reddish and do not have the drawings typical of the adults’ plumage. To date have been determined and accepted some subspecies but others are object of discussion by part of the scientific world and are not shared by all. We have the Ardea purpurea purpurea, the nominal species present in Europe, in Africa and in western Asia, the Ardea purpurea manilensis, present in the whole eastern area of Asia, the Ardea purpurea madagascariensis, of Madagascar and the Ardea purpurea bourney of the Cape Verde Islands. 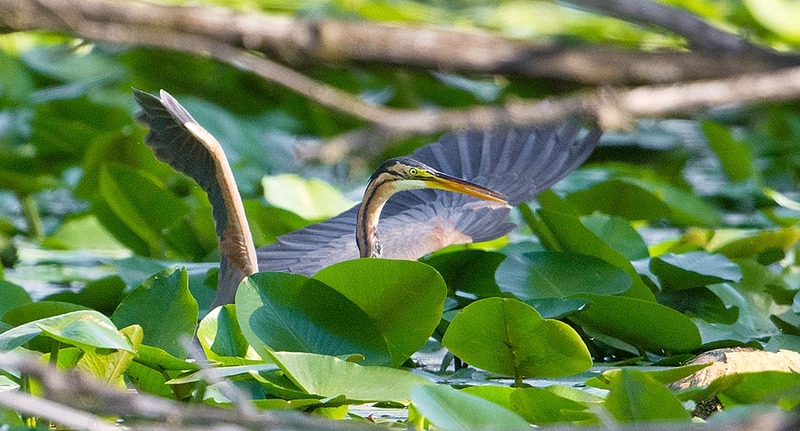 The purple heron usually nests in isolated couples and in inaccessible sites even if at times have been found scattered colonies formed by some couples, in particular on islets in the middle of water surfaces particularly appreciated due to the difficulty to be reached by possible predators. 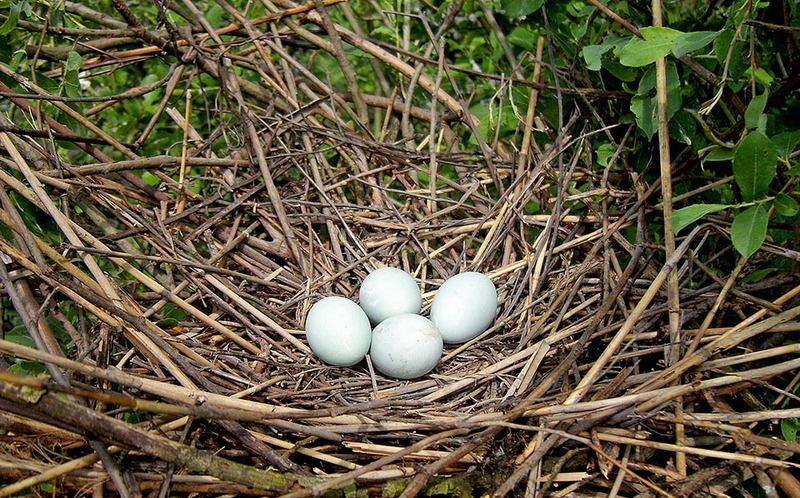 The nest is placed on the ground, at times in contact with water but always on pieces of phragmites or on slumped branches of a shrub or of a tree fallen on the ground and always surrounded by thick vegetation that occludes it from the view even from a short distance. However, they have observed even occasional instances of nesting on trees in rather high position and quite exposed. The platform is formed by dried up straws and by dried up material, piled messily widening up even to one meter of diameter. In the little deep cup formed in the middle of the structure, are laid 3 to 5 eggs of pale light blue colour that will be brooded by both partners for 4 weeks. The chicks will stay there for 40 days more, even if they will begin precociously to go around in the surrounding world clinging and floating, taking advantage from their very long fingers, on the carpet of straws surrounding them. They will become independent after 60-70 days more. 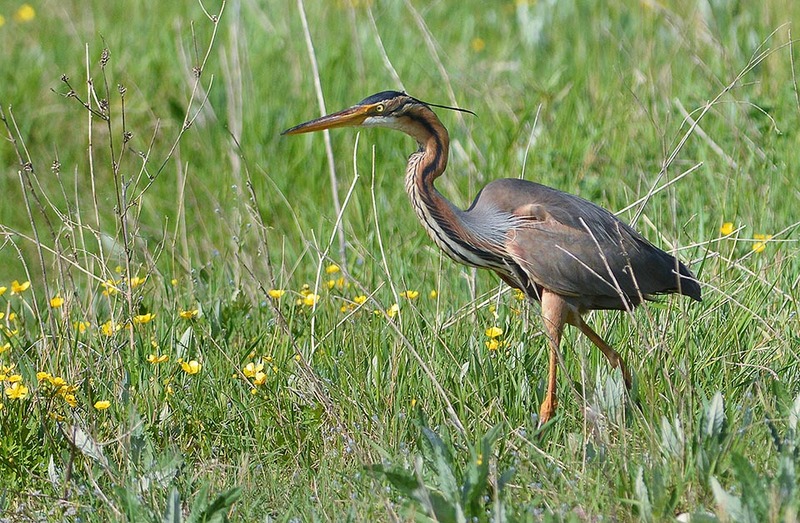 The purple heron nourishes also of frogs, as stated by the old vulgar Italian name, even if this is not its main food. It mainly hunts fishes and rodents, big insects and amphibians, lizards and crustaceans but also small birds and snakes it finds when carefully looking among the vegetation. 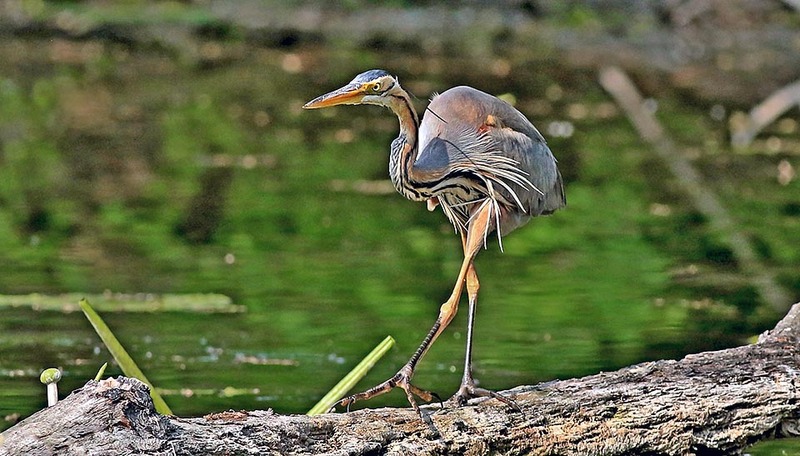 Like all ardeids, also the purple heron is a patient bird that spends a lot of its time motionless immersed mid-thigh in the water, carefully observing the world flowing around and ready with absolute rapidity to transfix a fish or a mice that inadvertently passes within its range. A rapid and sure shot and the prey is immediately gulped down whole. 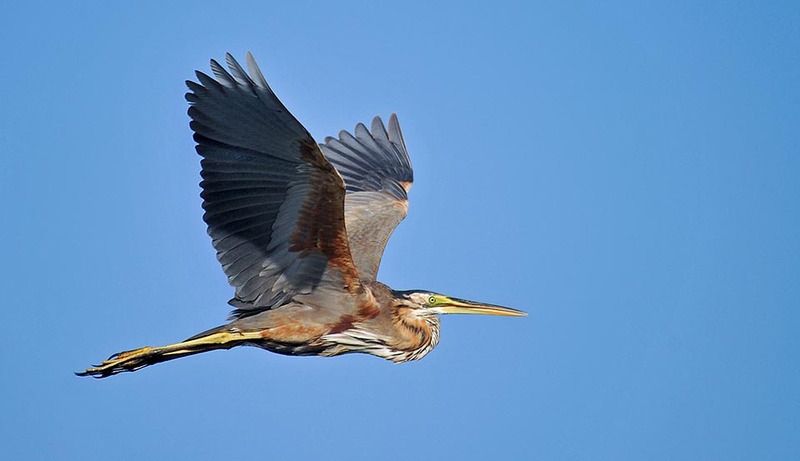 The flight of the purple heron is majestic and regal with slow beats, deep and continuous, and it gives the impression of never having haste to escape. Like all ardeids it keeps the neck S-bent and the legs elongated beyond the tail. It is not easy to observe them in flight as the displacements usually occur in the darkness or in the middle of the forest of reeds but when this happens they show in flight and proudly, that elegance that during the day is kept hidden into their hideouts. 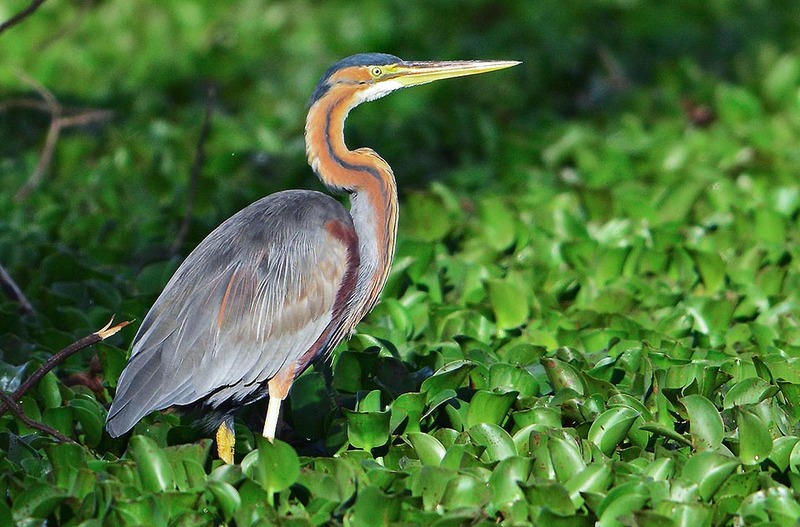 The purple heron may live about twenty years. Though being a little common bird and never present in a great number, and besides being unwitting victim of a continuous reduction of its natural environment, it is not considered as an endangered species.